These tips can help new users find the automation solutions that best suit their needs. The latest lab automation trend is for smaller automated workstations that are highly versatile. Lab managers want the flexibility to reconfigure and reuse an automated system by themselves, without the need for automation engineers. As the market offers a wide range of solutions, the following tips are designed to help new users find automation solutions that fit best. Capture and communicate your entire process. Start by capturing your complete workflow with an understanding of the critical timing of steps and points where variability is acceptable. These details can strongly influence the design of a flexible automation system. Also, determine the expected peak capacity of the system including when users will be available to load the system. Leaving out important details can make execution of lab automation challenging. For example, a failure to anticipate how much storage capacity your system will need for each type of plate can severely limit your system output and efficiency. Understand the differences between a liquid handler-centric workstation and a plate mover-centric platform. 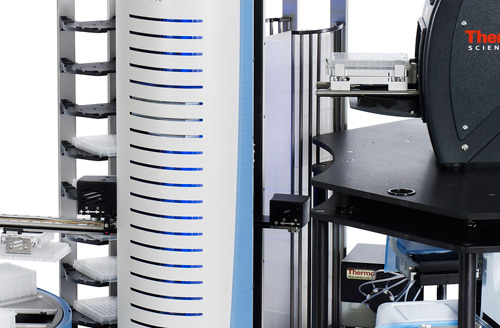 Many lab automation users start out with a liquid handler workstation where the integrated gripper performs all the plate movements on the deck and with a limited number of peripheral instruments. While great for a specific application, this can be very limiting for future flexibility. The processes are often hard coded for the liquid handler, where changes could require vendors to reprogram the system and with limited options for instrument extensions. The addition of a plate mover and scheduling software can greatly extend the system flexibility and ease of reconfiguration when your workflow needs to go beyond the liquid handling step. Scheduling software should provide easy drag-and-drop process building so users can reconfigure as often as they like. Also, liquid handling-centric systems can only process a single plate at a time as the robot cannot move plates and handle liquids simultaneously. A mover-centric system can move plates and coordinate multiple instrument operations allowing for greater efficiency. Select the right mover for you. If you are not an automation engineer and don’t plan to become one, select a mover that provides the right level of flexibility, speed, and ease of use. While automated systems can run unattended, occasionally users will be required to reteach where a mover has to present a plate to an instrument. This can be a simple wizard-guided process or a tedious and time-consuming one. Ask potential vendors how they and their mover are simplifying this task. Look for a vendor with a progressive software licensing model. A little purchasing diligence can save you a lot when you inevitably decide to make changes to your system. This could mean upgrading software to get new features, or adding a new instrument to gain new functionality. Many providers will just sell the licenses needed to work with the current instrument set in the system. A few vendors are moving to a model where their entire instrument driver library is provided and users can choose different combinations of instruments as their needs change or technologies improve. This allows you to future-proof your system without having to buy additional drivers. Hansjoerg Haas is product line director, laboratory automation at Thermo Fisher Scientific. Has A New Day Dawned for Medicinal Cannabis?